Kinley Marie Pinkley, 8, of Blue Springs, was born, September 7, 2010, in Blue Springs, the daughter of Kyle Pinkley and Christie Ruth. She departed this life Saturday, September 22, 2018, at her home surrounded with love and family after a three year battle with Metachromatic Leukodystrophy. 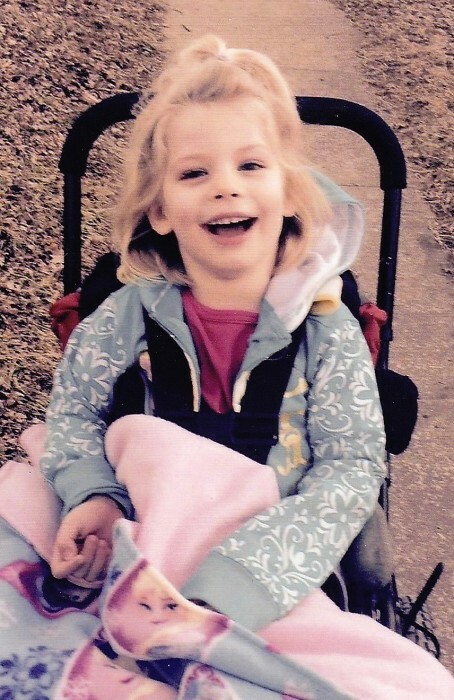 Kinley was a happy, outgoing little girl who treated everyone as a friend and knew no strangers. Her blue eyes and beautiful eye lashes drew compliments from all who met her. She loved swimming, roller coaster rides, taking walks, swinging and most of all, playing with her friends and family. She had such a joyous and bubbly personality that all who met her quickly fell in love with her. She is survived by her mother Christie Ruth of the home; father Kyle Pinkley of Blue Springs; one brother, KylandPinkley of Sedalia; maternal grandfather, Lance (and Linda) Ruth of Greenwood, and maternal grandmother, Penny Ruth of Blue Springs; paternal grandmother, Kim “Gramoo” Brecht of Raytown; paternal great grandma, June “Nana” Pinkley of Harrison, Arkansas; paternal great grandfather, Walter “Poppy” Brecht of Lowry City; other relatives and friends. Visitation was held Friday, September 28, 2018, at the funeral home. Funeral services were held Saturday, September 29, 2018, at the First United Methodist Church, Pleasant Hill. Reverend J.R. Brown officiated. Interment was in the Greenwood Cemetery. Casket bearers were James Campbell, Chris Briggs, Bill Glass, Mike Belman, Josh Ruth, Matt Wright, Jason Dillon, and Danny Ware. Memorial contributions are suggested to the Make-A-Wish Foundation or the Ronald McDonald Room at Children’s Mercy.